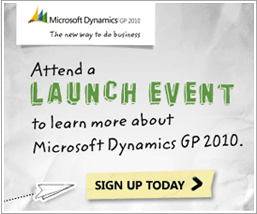 Microsoft Dynamics GP2010 is here! This latest release of Microsoft Dynamics GP extends the reach of insight, productivity, and collaboration across the entire business, helping to ensure that people—an organization’s most powerful asset—and the different ways they work continue to drive business success. New capabilities deliver faster access to personalized business intelligence, enhanced ways to streamline business processes, and new ways to build stronger business relationships. Is your technology strategy in-line with your overall corporate objectives? Does your current IT infrastructure support your requirements for today and tomorrow? Are you providing the best and most powerful tools for your Information Workers? The success of your company is directly related to the success of the people who work for you. Microsoft Dynamics is a line of integrated, adaptable business management solutions that enable your people to make important business decisions with confidence. Microsoft DYnamics work like familiar Microsoft software -- easing adoption and reducing the risks inherent with implementing a new solution. These solutions automate and streameline financial, cusotmer relatinoship, and supply chain processes in a way that can help you drive business success. Microsoft Dynamics comprises several unique software products to meet almost any business need. It's About Time and Money - TECHVISIONS & Nodus Technologies Help Carmichael Traning Systems Save Both. Accounting and Inventory Control Integration Improve Customer Service and Administrative Efficiencies. TECHVISIONS Consulting Services Results in an Efficient Document Management Solution.